The Fed raised rates another 0.25% the week before last. This marks the 5th rate hike since the Fed embarked on its policy tightening in December 2015 and the fourth rate hike in the last 12 months. The Fed’s latest statement also indicates it plans on raising rates three more times in 2018. 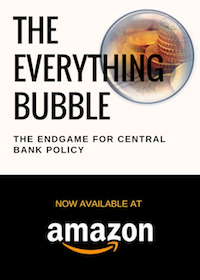 It is easy to gloss over the significance of this, but the Fed’s actions are indeed unusual; other major Central Banks (the Swiss National Bank, Bank of Japan, European Central Bank and Bank of England) are all currently running QE programs (the BoJ, ECB and BoE) or openly printing new money to buy stocks outright (the SNB). What precisely is the Fed doing? Why the urge to tighten when other banks are all printing new money by the billions? The following quotes from Fed offer us clues. Stock valuations are at high end of historical levels. I want to be clear on the significance of these statements. With that in mind, the above quotes are astonishing in their clarity: the Fed is explicitly stating (in Fed terms) that the markets are in a bubble. And the Fed didn’t just do this once, the Fed has been warning about asset valuations/froth in the system for six months straight. So just how “frothy” are things that the Fed is being so explicit? Perhaps the best means of measuring frothiness in stocks is the Price to Sales (P/S) multiple. Most investors prefer to use Price to Earnings (P/E), but I am wary of that method because earnings can easily be fudged via gimmicks (different methods of depreciation, write-offs, reducing loan loss reserves, tax loopholes, etc.). Sales, on the other hand, are very hard to fudge. Either money came in the door, or it didn’t. And if a company gets caught fudging its revenues, someone goes to jail. 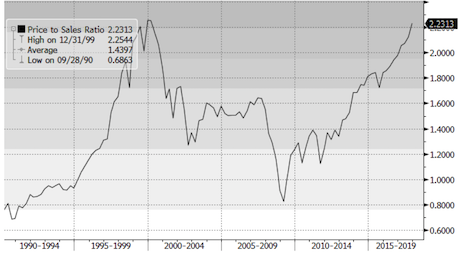 With that in mind, consider that the S&P 500’s current P/S multiple has surpassed its former all time peak from 1999: a period that is now widely considered to be the single largest stock bubble in history. Put simply, stocks are extraordinarily overvalued by a reliable measure. Namely, that the Fed has been INTENTIONALLY creating bubbles for nearly 20 years today… and it’s out of more senior asset classes to use! The late ‘90s was the Tech Bubble. When that burst in the mid-‘00s, the Fed created a bubble in housing. When that burst in ’08 the Fed created a bubble in US sovereign bonds or Treasuries. 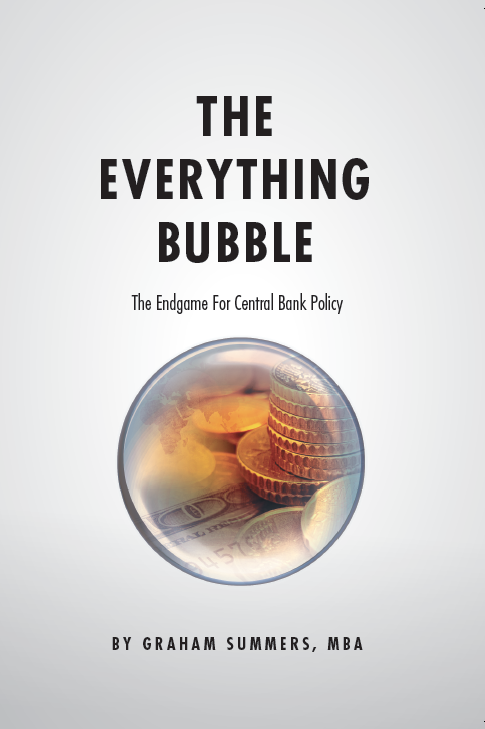 And because these bonds are the bedrock of the US financial system, the “risk-free rate” of return against which ALL risk assets are valued, when the Fed did this it created a bubble in EVERYTHING (hence our coining of the term “The Everything Bubble” and our bestselling book by the same name).